Amazing Features of the Twilight Series Hot Tub | Austin TX - Paradise Spas & Outdoors Living | Hot Tub Store, Swim Spas, Patio Furniture, and More! Why just buy a hot tub when you can buy a hot tub experience? The Twilight Series by Master Spas has all the features. The Twilight Series by Master Spas has all the features. Seating, therapy, entertainment; the Twilight Series hot tub gives you all the luxury without the 5-star hotel. Continue reading and we’ll show you exactly what you’re looking for in a hot tub experience. Paradise Spas and Outdoor Living in Austin TX is the place to help make your hot tub and spa dreams come true. Seating Ergonomic design: You’ll spend 90% of your time seated in your hot tub, so don’t just sit, relax. The seating in the Twilight Series hot tub was specifically engineered to contour to your body, the minute you sit down. It’s form fitting seats allow you to relax naturally, while specific jet placement delivers hydrotherapy from head to toe. Hydrotherapy Master Blaster Foot Therapy: It’s the first thing you feel at the end of a long day, your feet. With the hydrotherapy of the master blaster for therapy system, your feet will feel rejuvenated. This system uses dual jets with 28 total individual nozzles to give you the most relaxing foot massage. Want to know how important we think your feet really are? The Master Blaster Foot Therapy System is powered by a separate oversized pump that pumps 200 gallons per minute, just to soothe those aching feet. Sights & Sounds Dream Lighting: Lets face it. A brand-new hot tub in your backyard is more than noticeable. That’s why the Dream lighting in the Twilight Series Hot Tub provides ambiance and turns your hot tub from just a spa to a beautiful accent. The glow is both warm and inviting for maximum use of your hot tub. Orion Light System: The Orion Light System is easy to use and far from ordinary. With top-side controls, you can create a custom light show. Watch as an array of colors illuminates the controls, water features, under the water, and more. Afterglow Light Package: Although this package is optional, you’ll definitely want it. This feature gives your spa even more visual appeal by adding kaleidoscope colors into the jets. These are just a few features that are not only amazing, it would be hard to live without them! Paradise Spas and Outdoor Living is an exclusive dealer for Masterspas so you are guaranteed high quality, premium brands that offer desired features, and performance! Visit our showroom near the Greater Austin TX area today, and browse our vast selection of hot tubs. You will find a variety of sizes and designs that cater to your desires. Consultations are always FREE. 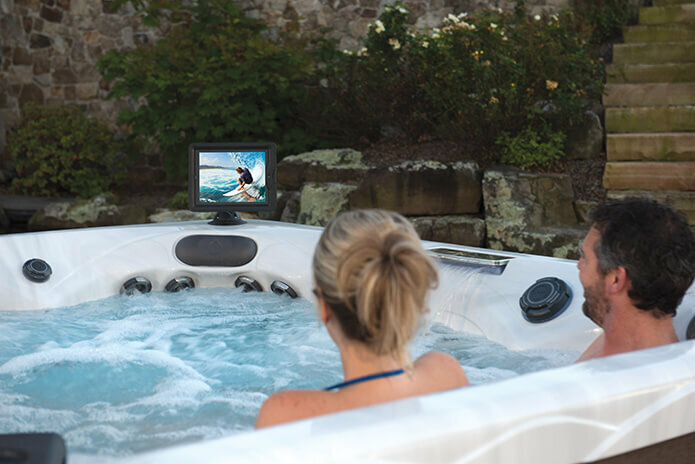 Contact us today, our experienced hot tub technicians will help you select the perfect Hot Tub!